However, the real superiority of ceramic smokers has been as a result of the brand reputation in producing excellent kitchen appliances. This detailed review provides sufficient information to help you judge this smoker in the light of others. Why Should You Purchase the Best Ceramic Smoker? There is no single feature on which we exclusively hinged our judgment and conclusion that this smoker is great. In our analysis, we compared the worth of your money and the worth of this appliance. Our findings indicate total conformity of the smoker to the modern and relevant standards and requirements. Ceramic outer blend coating of the smoker and its flexibility are features rarely found in an ordinary smoker. These features are meant to increase durability and efficiency, making Primo 778 Extra-Large Oval Ceramic Charcoal Smoker Grill a functional appliance. 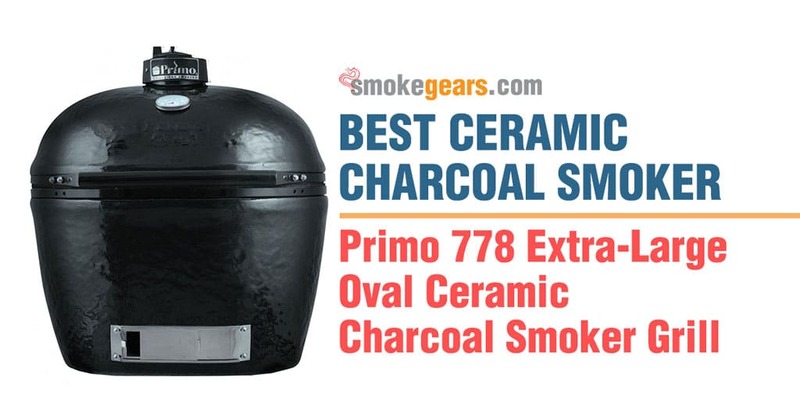 Primo 778 Oval Ceramic Charcoal Smoker comes with a lifetime limited warranty plus 20 year warranty of its parts. This is what makes it trusted and unbeatable model of charcoal smoker. Security accorded to its safety is a proof enough that the product is indeed worth your money. As indicated earlier, this unit comprises of both wonderful internal and external features meant for flexibility and efficiency. Versatility is among the features that make it an ultimate alternative for multiple categories of users. Grilling, searing, baking, smoking and roasting are all possible with this single unit. The oval shape and patented design increases surface area for effective performance of the above functions. Accessibility to the cooking food is also made easier by the patented oval shape. This allows for convenient cooking of steaks, ribs, whole chicken, and large roasts among other food types. The standard cooking surface alone amounts to 400 square inches. With rack extensions, you can enjoy up to 680 square inches of cooking space. This allows you to prepare large quantities of food without worries of running out of space. As such, the smoker is good for home and commercial use. It is hard to come across a company that allows a limited lifetime warranty for its products. At no time will you encounter any manufacturer’s problem for as long as you stay with your smoker. If this ever happens, simply return the product to the US-based manufacturer and have an instant replacement or refund. On the outer part of the smoker, it features a premium-grade ceramic blend coated with a protective, lead-free, scratch-resistant porcelain glaze. These features increase the lifespan of the smoker and ensure sustained efficiency. Who is Suited for Best Ceramic Charcoal Grill Smoker? Quality Seekers: This smoker has the potential of achieving quality in two ways. First, the ceramic material which is its main material is inarguable one of the best on the market. Therefore it is high quality. Secondly, the quality of food it produces is of distinct flavor and taste. For those whose quality of foods and quality of appliance are the priorities, we recommend Primo 778 charcoal grill. Individuals who are making a final decision: This smoker is long-lasting and will never easily require you to replace if proper maintenance is upheld. A limited lifetime warranty also ensures that you are not affected with any defects arising from the product manufacturer. This makes the appliance suitable for final those who do not plan to buy any other similar smoker. US Residents: If you live in US, then you are a potential user of the best ceramic smoker. The Primo 778 is a brand based in US and has the interests and needs of US residents at heart. For this reason, US-based users are the most ideal beneficiaries of this high quality smoker. Warranty information is vital in making judgments regarding product efficiency and effectiveness. For the purposes of surety, we used multiple approaches to arrive at our conclusion of the product efficiency. Apart from closely examining warranty information and its association with efficiency, we also visited the Primo brand. It took us no time to confirm that the product works which even persuaded us to purchase the smoker. A team of manufactures expressed confidence in the product quality, service and efficiency. We engaged 5 individuals in a random interview and surprisingly, all their responses were similar. We went ahead to purchase our own and now it is one year down the line. We use it regularly and it gets better and interesting day by day. So we are sure that this smoker does not let customers down. Instead it makes you a winner, not a gambler. Lifetime product warranty assures elongated lifespan. High quality ceramic material makes it a durable smoker. It is a versatile equipment. Proudly manufactured in US, thus most appropriate for US residents. Features a great and convenient size and design. Not all parts are of high quality. After investing in your previous or present smoker, you might have realized where you made mistake in your previous decision. Now Primo gives you an opportunity to correct. This ceramic charcoal smoker requires prior planning and adequate investment. Our reviews are a perfect guide to inform your decision. Its strengths are obvious and weaknesses are easily manageable. For instance, your level of care determines how you will experience the goodness of this Primo 778 Extra-Large Oval Ceramic Charcoal Smoker Grill. All in all, it is a wise investment because it is worth your money and results in no regrets at all.